The need for vascular access in the pediatric patient is frequent  ; however, placement of a peripheral line may not be feasible or appropriate. The options available to clinicians have increased over the years; central venous access devices (CVADs) are now used with greater frequency. This article discusses the various options available for central venous access and their advantages, disadvantages, and complications. The history of cannulation of a central venous structure can be traced back to 1929, when Forssmann described advancing a plastic tube near the heart by puncturing his own arm. In the 1950s, Aubaniac used the subclavian vein to insert a central venous catheter (CVC). Since then, several more access routes of have been described. Advances in equipment have made the use of CVADs safer and more common. CVADs come in many different sizes and brands that allow the clinician to choose the best device for each patient. However, the small sizes of the devices and of pediatric patients can complicate CVAD procedures in children. After the decision has been made to place a CVAD, a suitable approach is chosen. A clear understanding of the anatomy is needed for each of the different approaches. 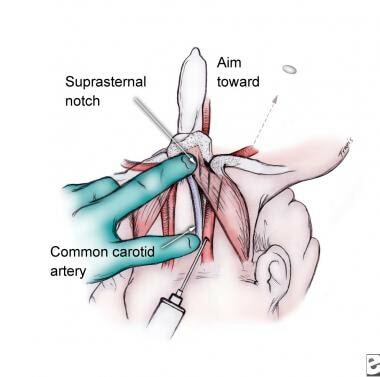 The four main approaches to central venous access discussed here include the internal jugular, subclavian, femoral, and PICC techniques. The internal jugular vein (IJV) lies parallel and lateral to the carotid artery in the neck. (See the images below.) It lies within the carotid sheath, which includes the carotid artery and vagus nerve. The IJV is a branch of the brachiocephalic vein. 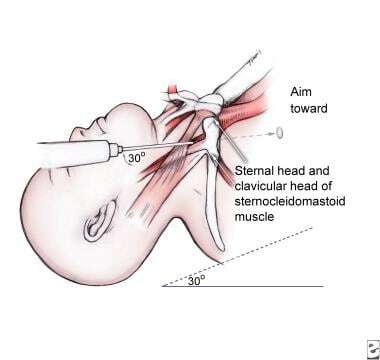 Internal jugular vein, anterior approach. Internal jugular vein, central approach. 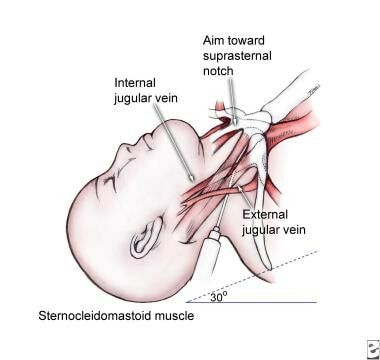 Internal jugular vein, posterior approach. The subclavian artery lies posterior and somewhat superior to the brachiocephalic vein. These two vessels are separated by the anterior scalene muscles. The subclavian vein begins distal to the branch point of the IJV. It crosses under the clavicle at the medial to proximal third of the clavicle. The subclavian artery is located deep and slightly superior to the vein. In children, the subclavian vein has a more cephalic location than it does in adults; that it dives under the clavicle closer to the medial third. Deep to the vessels lies the first rib, which is just superficial to the pleura and lung. The femoral vein is a branch of the external iliac vein. (See the image below.) It crosses deep to the medial third of the inguinal ligament. A common mnemonic for the anatomy of the femoral vessels from lateral to medial is NAVEL (Nerve, Artery, Vein, Empty space, Lymphatics). Femoral vein approach. Remember mnemonic NAVEL: nerve, artery, vein, empty space, and lymphatics. The relevant anatomy for inserting a PICC line includes the superficial veins to be used. These are primarily located in the arms (cephalic and basilic veins), scalp (superficial temporal vein), or neck (external jugular vein). The umbilical system consists of two arteries and one vein (see the image below). The vein is usually at the 12-o'clock position and is larger with thinner walls, whereas the arteries are located inferiorly with thicker walls. Occasionally, a persistent urachus may be encountered and mistaken for the vein; however, a return of urine quickly reveals the error. Umbilical vein cannulation in newborn. The vein travels to the inferior vena cava (IVC), or it could turn to the portal system. The umbilical artery turns inferiorly and then continues to the pelvis, where it meets the internal iliac artery continuing cephalad to the bifurcation of the aorta. Approximately 5 million CVC insertions are performed every year in the United States. This rate accounts for 15 million CVC days each year in the intensive care unit (ICU). The use of CVCs in the ICU is similar in adult and pediatric patients. The outcome and prognosis of patients with a CVAD directly depends on the complications (see Treatment, Complications). If complications are minimized, the outcome related to placement of these lines is excellent. In addition, meticulous and sterile care of the CVAD can also prevent line infections. Ares G, Hunter CJ. Central venous access in children: indications, devices, and risks. Curr Opin Pediatr. 2017 Jun. 29 (3):340-346. [Medline]. Forssmann W. Die Sondierung rechten Herzens. Klin Wschr. 1929. 8:2080. AUBANIAC R. [Subclavian intravenous injection; advantages and technic]. Presse Med. 1952 Oct 25. 60 (68):1456. [Medline]. He C, Vieira R, Marin JR. Utility of Ultrasound Guidance for Central Venous Access in Children. Pediatr Emerg Care. 2017 May. 33 (5):359-362. [Medline]. Zanolla GR, Baldisserotto M, Piva J. How useful is ultrasound guidance for internal jugular venous access in children?. J Pediatr Surg. 2017 Aug 17. [Medline]. Skippen P, Kissoon N. Ultrasound guidance for central vascular access in the pediatric emergency department. Pediatr Emerg Care. 2007 Mar. 23 (3):203-7. [Medline]. Lomonte C, Basile C. [Management of central venous catheter: prevention of thrombosis and bacteremia]. G Ital Nefrol. 2009 Jan-Feb. 26 (1):73-80. [Medline]. Leung J, Duffy M, Finckh A. Real-time ultrasonographically-guided internal jugular vein catheterization in the emergency department increases success rates and reduces complications: a randomized, prospective study. Ann Emerg Med. 2006 Nov. 48 (5):540-7. [Medline]. Verghese ST, McGill WA, Patel RI, Sell JE, Midgley FM, Ruttimann UE. Ultrasound-guided internal jugular venous cannulation in infants: a prospective comparison with the traditional palpation method. Anesthesiology. 1999 Jul. 91 (1):71-7. [Medline]. Bruzoni M, Slater BJ, Wall J, St Peter SD, Dutta S. A prospective randomized trial of ultrasound- vs landmark-guided central venous access in the pediatric population. J Am Coll Surg. 2013 May. 216 (5):939-43. [Medline]. Miller JW, Vu DN, Chai PJ, Kreutzer JH, John JB, Vener DF, et al. Upper body central venous catheters in pediatric cardiac surgery. Paediatr Anaesth. 2013 Nov. 23 (11):980-8. [Medline]. Soucy P. Experiences with the use of the Port-a-Cath in children. J Pediatr Surg. 1987 Aug. 22 (8):767-9. [Medline]. Fallon SC, Larimer EL, Gwilliam NR, Nuchtern JG, Rodriguez JR, Lee TC, et al. Increased complication rates associated with Port-a-Cath placement in pediatric patients: location matters. J Pediatr Surg. 2013 Jun. 48 (6):1263-8. [Medline]. Ullman AJ, Cooke ML, Mitchell M, Lin F, New K, Long DA, et al. Dressings and securement devices for central venous catheters (CVC). Cochrane Database Syst Rev. 2015 Sep 10. CD010367. [Medline]. Dolcino A, Salsano A, Dato A, Disma N, Pini Prato A, Bernasconi F, et al. 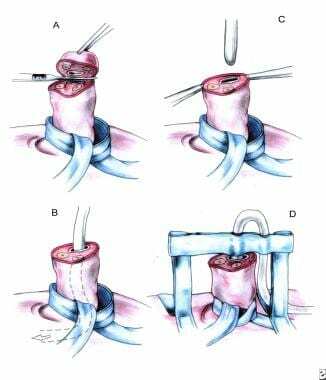 Potential role of a subcutaneously anchored securement device in preventing dislodgment of tunneled-cuffed central venous devices in pediatric patients. J Vasc Access. 2017 Nov 17. 18 (6):540-545. [Medline]. Casado-Flores J, Barja J, Martino R, Serrano A, Valdivielso A. Complications of central venous catheterization in critically ill children. Pediatr Crit Care Med. 2001 Jan. 2 (1):57-62. [Medline]. Goede MR, Coopersmith CM. Catheter-related bloodstream infection. Surg Clin North Am. 2009 Apr. 89 (2):463-74, ix. [Medline]. Newman N, Issa A, Greenberg D, Kapelushnik J, Cohen Z, Leibovitz E. Central venous catheter-associated bloodstream infections. Pediatr Blood Cancer. 2012 Aug. 59(2):410-4. [Medline]. Henrickson KJ, Axtell RA, Hoover SM, Kuhn SM, Pritchett J, Kehl SC, et al. Prevention of central venous catheter-related infections and thrombotic events in immunocompromised children by the use of vancomycin/ciprofloxacin/heparin flush solution: A randomized, multicenter, double-blind trial. J Clin Oncol. 2000 Mar. 18 (6):1269-78. [Medline]. Kramer RD, Rogers MA, Conte M, Mann J, Saint S, Chopra V. Are antimicrobial peripherally inserted central catheters associated with reduction in central line-associated bloodstream infection? A systematic review and meta-analysis. Am J Infect Control. 2017 Feb 1. 45 (2):108-114. [Medline]. Massicotte MP, Dix D, Monagle P, Adams M, Andrew M. Central venous catheter related thrombosis in children: analysis of the Canadian Registry of Venous Thromboembolic Complications. J Pediatr. 1998 Dec. 133 (6):770-6. [Medline]. Shin HS, Towbin AJ, Zhang B, Johnson ND, Goldstein SL. Venous thrombosis and stenosis after peripherally inserted central catheter placement in children. Pediatr Radiol. 2017 Nov. 47 (12):1670-1675. [Medline]. Chaitowitz I, Heng R, Bell K. Managing peripherally inserted central catheter-related venous thrombosis: How I do it. Australas Radiol. 2006 Apr. 50 (2):132-5. [Medline]. Jacobs BR, Haygood M, Hingl J. Recombinant tissue plasminogen activator in the treatment of central venous catheter occlusion in children. J Pediatr. 2001 Oct. 139 (4):593-6. [Medline].